FORMER President, Jacob Zuma celebrated his 77th birthday last Friday. The celebrations were full of laughter, drinks, food and family! True JZ style. Msholozi celebrated his birthday with his lovely family over a luncheon. Since his resignation from presidency, Zuma has been living life to it's fullest! READ: PICS: ZUMA GOES FOR A SWIM IN THE 'FIRE POOL'! With all the spare time that he has now, Msholozi has more time for his social media pages, he's even become a hit on Twitter. 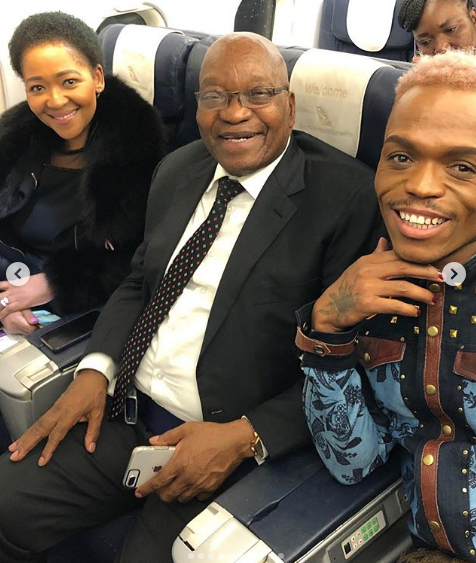 The video sees JZ with his wife, Thobekile Zuma, who also recently celebrated her birthday, jetting off with Somizi and Babes Wodumo on the flight. The flight was delayed and to kill time Somgaga sang for the former president wishing him a Happy Birthday. Wife, Thobeka Madiba Zuma shared the video writing “Thank you @somizi and @babes_wodumo for wishing hubby the happiest birthday. Time to call it a day or get the show started???? #happy #birthday#msholozi #wifelife??” . Here is to more celebrations of the most beautiful soul I know. It was the happiest birthday indeed..thank you all for the warmth, love and support, throughout. Truly amazing #happybirthday #msholozi #speak #life #gods #protection #we #love #you ????????? A life worth being celebrated...having given up your youth Msholozi, took up arms and fought for us to dance freely under the African Sun. The freedom which we will never take for granted. Spending 10 x 365 days in jail eating white porridge every morning, umbila obilisiwe served for lunch and dinner every single day. Did not get the opportunity to bury my Mother In Law. All in the name of breaking your spirit. Spent more years in exhile udliwa oMosquito in the bushes, with malaria and death glaring at you. You have done your bit my love and I have every reason to spoil you and sip champagne with you. And love you like you have never been loved before because you were deprived the most important thing ie Love. Let me stop there and God help me to forgive and not forget. I love you unapologetically and have...for 26yrs marching into our 27th year of Love and Light #happybirthday #msholozi #hubby #loved #by #madiba #zuma ??????? ?